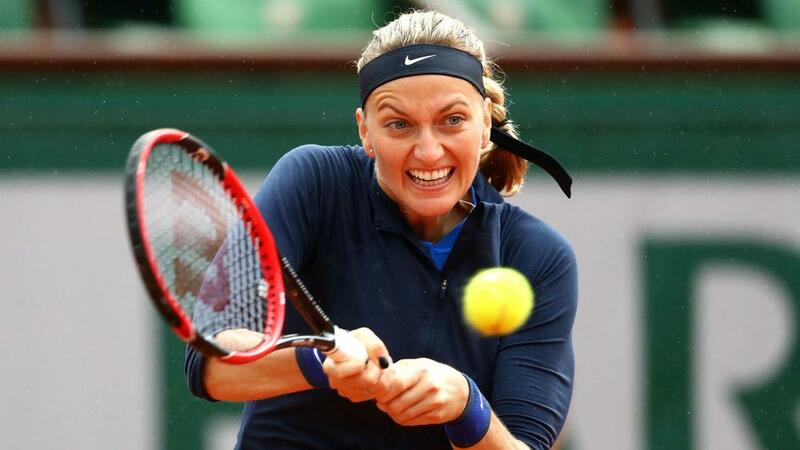 Petra Kvitova recovered from being on the brink of a shock defeat against Danka Kovinic to advance to the second round on a rain-affected first day of the French Open. World number 57 Kovinic had the opportunity to serve for the match at Roland Garros on Sunday, but two-time Wimbledon champion Kvitova dug deep to win 6-2 4-6 7-5 on Court Philippe Chatrier. Last year's runner-up Lucie Safarova had no such trouble as she hammered outsider Vitalia Diatchenko 6-0 6-2 before the bad weather returned to ensure only five matches could be completed in the women's singles. Anastasia Pavlyuchenkova, Viktorija Golubic and Su-Wei Hsieh also advanced to round two of the grand slam on the famous clay courts in Paris. Kvitova found herself two points from a surprise early exit at the hands of aggressive baseliner Kovinic and the 10th seed breathed a sigh of relief after overcoming the Montenegrin. "I started pretty well, and I think that the conditions weren't really easy today." said the world number 12 from the Czech Republic, who will face Hsieh in the second round. "I think that in the second set when I was serving to make it 4-1, I missed four easy backhands and I felt like that was kind of the turning point and I was kind of down mentally after this game. I think she just came back and tried to play more aggressive. I was, I think, running too far behind the baseline. I was just trying to put the ball in, but it's not really my game. "It was a very difficult match today. But in the end, I think that the end of the match was kind of sorry from my side. It was a big fight again. I'm happy that I won it." Safarova was denied a first grand slam title by Serena Williams at Roland Garros last year and looked capable of another impressive showing on the red stuff 12 months on as she outclassed Diatchenko. The 11th seed, who now takes on Golubic in round two, broke six times and took advantage of 27 unforced errors from her opponent to ease through. Sixth seed Simona Halep and the 2015 Wimbledon runner-up Garbine Muguruza were among the players left kicking their heels due to the inclement weather in the French capital. Halep is now due to face Nao Hibino on Monday, while fourth seed Muguruza will also be in action a day later than scheduled against the out-of-sorts Anna Karolina Schmiedlova.